I didn’t actually plan on running any races from the last of my very busy spring 2015 schedule until the Baltimore Marathon. I had so many races that I was actually kind of burned out on them and I needed a break to focus on training for an even bigger running event. 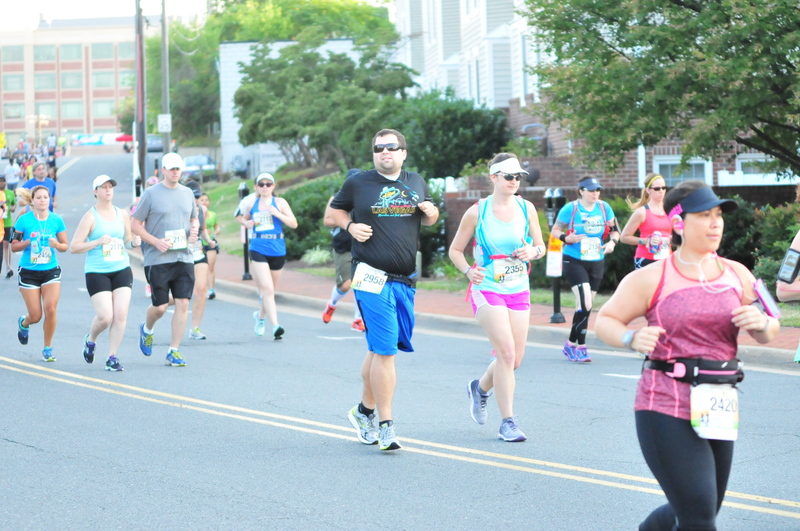 However, with every marathon training plan comes the half-marathon “time test,” so that’s pretty much the only reason I decided to sign up for the Potomac River Runners Leesburg 20K. It was quite providential that it occurred on the same day as my planned half-marathon. Plus, I’m all about experiencing as many races as I can around here, and it was only $45 to enter. Hello? Thank you very much. I felt a little conflicted about my goals for this race. The half-marathon is part of marathon training because it’s supposed to be a good way to forecast your marathon performance. My goal time for Baltimore is 4:00, which means I need to run a 9:06 pace. I have definitely done that before or at least come close to it in past races. However, I feel like I am just starting to get “good” at running again and I am nervous that running that fast will hurt me more than help me. That has seemed to happen to marathoners before– something about gunning it on underworked fast twitch muscles. I didn’t want that to happen to me, just for a race I was already going to PR at. Plus, I wonder if paddle-boarding, walking uphill every day, and the Iron Strength Workout can be credited for my good running streak. Regardless, I’m facing a conundrum of how to set my goals. Quick assessment of my training thus far: Most of my easy pace runs are well over the goal pace range, even when I don’t mean to run that fast (really not bragging here, I’m quite baffled actually). My pace runs have been few and far between, but when I do run them, I run below goal race pace without really trying (I swear, I’m not bragging). My long runs have felt manageable until the end, but that’s because I’m building the endurance to sustain a marathon, and my paces have been in the middle of my goal long run pace range. On top of all that, with two marathons to run a week apart, I’m not even sure if I should be going for a 4:00 marathon because I don’t know if I can recover from a hilly, fast marathon before I have to do it again. I’d rather run two slower marathons than get a DNF, especially at the Marine Corps Marathon. I decided to set up my goals for this race like this: first goal, race pace; second goal, medium effort run; third goal, use this as a long training run. I hate getting wrapped up in numbers here when it really all comes down to race day factors. Will I get enough sleep? Will I get enough to eat? Will it be as muggy as it’s predicted to be? Will a weekend of paddle-boarding wear me out too much? Will I be dehydrated? This might be a dress rehearsal, but this is more a fun run than anything and I can live to run another day. I’m just excited that this training run comes with a medal. I was also seriously dehydrated. Saturday was a pretty awful day for me in my personal life– a lot of hydration expended at a significant loss. I don’t want to go into what happened, and I knew all day the day before that I was losing water and not replacing it. I also really screwed up on my carbo-load. I had spaghetti on hand but no sauce. So I decided that, because I’d had a bad day, I would order a pizza. I chose a Brazilian-style pizza that had a kind of cheese I’d never heard of: catupiry. Turns out, it’s a very popular mild soft cheese from Brazil. The pizza was a very thin crust with shreds of barely-seasoned shredded chicken on a thin layer of sauce with parsely and paper weight-sized globs of catupiry cheese. Catupiry cheese is a spreadable cheese, kind of like mascarpone or cream cheese, so I imagine that I might actually enjoy it if it was spread over the pizza and wasn’t literally globbed onto it. If you live in the DC-area, it’s the Rio de Janiero pizza from Piola. You’ve been warned. Leesburg is about a 45-minute drive from DC, unless you want to avoid the toll roads in which case, add 15 minutes. Probably worth going the long route on the way there and avoiding it on the way back. I paid about $8 to get through the tolls and onto the Dulles Greenway for just one trip. Being from Nebraska where we don’t have toll roads, I loathe paying them. If you get to Leesburg early enough, you can park for free in the Leesburg government building parking garage. I got there just about 6:45 and I overheard people telling cars on the way in that it was full upstairs. The seriously great thing about this race, if you are coming in from a distance, is that you can pick up your packet at the race venue. There’s no need to make the same trip twice. While the line to pick up packets was a little unorganized, I got my race shirt and bib with ease and I was close enough to where I parked that I had plenty of time to drop off my bag at my car instead of checking it. There is also race registration for those who decide at the last minute to run it, so people were filling out waivers and getting bibs up to 15 minutes before race start. One thing I did not have much time to do was use the johns. The lines were insanely long for a long line of them. It is what it is, really. I mean, what are race organizers supposed to do– get a john for every runner there? The only problem I had with the situation was that I was in line up until 7:27AM and when I got to the top of the hill where the start line was, only then did I hear the announcer say that if 20K-ers were in line, we had about 15 more minutes before the start of the 5K to begin our race. Wish I had known that… I didn’t stop until 2 miles into the race. Ugh. 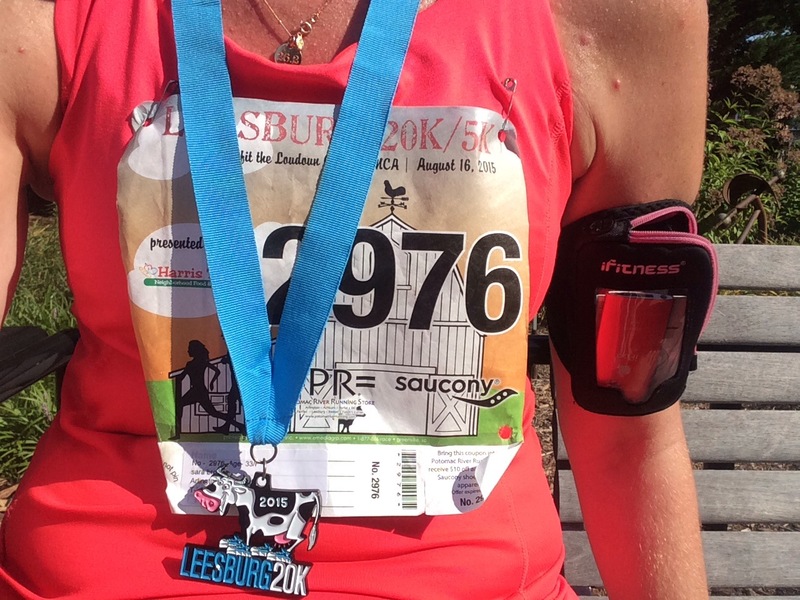 The Leesburg 20K starts in the historic district of Leesburg and winds through town for a little bit before taking place almost exclusively on the W & OD Trail. Funny thing was, we ran past the high school at about 1.5 miles and only then did I remember that, back in 2010 when I attempted a triathlon through Team in Training, I had probably the most miserable workout of my life there. It was in that high school parking lot that I realized I couldn’t get through the triathlon because they didn’t set me up very well with weekly training plans, thus leaving my only training for an Olympic-distance triathlon on the weekends when we’d all go on 45-mile bike rides (me on a mountain bike!) and then run 3-5 miles in circles around the school. If I’d known I’d be back there 5 years later running a 20K, I’d have said, “No effing way.” Anyway, just a brief glimpse back on my life in endurance sports. Race morning was actually pretty cool at the start– somewhere in the 60’s– but the day would climb to around 90 later on. I had water on me, but I didn’t say no to any of the water stops either. The course was actually pretty shaded, too, so it stayed rather cool. I ran toward the middle-back of the pack– it became clear to me when I started running that this would just be a training run for me. Because of what had happened the day before, I was in no mood to run. My heart was not there and neither was my head. I actually didn’t want to run it when I started going. If it weren’t for this race, I might not have run at all on Sunday. Because of that, I think, the race felt much longer than 12.42 miles. I just wanted to be done from mile one. Interestingly, despite my lack of care for this race on this day, I think this run actually turned into precisely the type of run I would want to execute at the Baltimore Marathon. For the first 5 miles, my paces ranged from 10:16 to 10:02. Even though I didn’t realize it, we were running uphill. I thought my legs were just tired. I just hung back and ran whatever I felt like I could maintain. I had a few issues at start– the aforementioned rest stop just before mile 2 and I had to move my bib up to my chest because my hands kept hitting it when it was pinned at my stomach, not to mention I had to find my long run playlist on my iPod after I realized my iTunes library is a little depressing. There were some steeper hills somewhere in the 5th mile when the W & OD let out onto a sunny, hot patch of highway where we all had to cross over the Interstate and then wind up a big hill. Some people walked (there were a surprising amount of walkers in this race), but I just focused on getting up the hill– it’s part of my training to run the hills. Some parts of the trail were bottle-necked as runners started passing each other near the turn-around. We all turned around just before the 7th mile and crested a final hill at mile 8.29. And then, the rest of the race was downhill. I started running really fast. Like, really fast for a race-turned training run. Miles 8 to finish were run at splits between 10:26 and 9:03. And it felt comfortable. I refused to look at my watch– if I was going too fast, I didn’t want to jinx it. If I was going to slow, I didn’t want to know. I realized that running in the mental sweet spot of being present, realizing you are comfortable with the pain, being happy because it somehow feels easy is all just one thought away from turning completely around. I sort of realized that I hadn’t thought about what was bothering me for a few miles until all of a sudden, I remembered. I just thought to myself, Don’t go there, don’t think about anything else, just be here right now. So I put aside thoughts of sadness and just ran. I sort of just zoned out. The finish line always feels great to cross, and I was so happy to be done. Considering what was on my mind and heart, the heat, and the hills, I was very happy to have finished this race in 2:03:47 for an average 9:53 pace, unofficially. The post-race goodies were also great– bottles of ice cold water, bananas, apples, cheese crackers, Oreos, gummy fruits, cookies, and Gatorade. There was no post-race entertainment, like a band, so I pretty much left the race right away. If you want to stay, however, there are lots of options for brunch. I just kind of wanted to get home, but it took me forever to get through Starbucks on my way out of town. Lots of runners seemed to stick around for a little socializing. If you can, definitely put this race on your list next year. It’s perfect for a training run in August, the entry fee was very low, and the race swag was awesome. The medal was fantastic, too. The course support was provided by local cross-country clubs, and the kids were very supportive and excited for us. I hope we inspired them to continue running in events like this as adults, but I was also inspired that they were involved in running so young and that they actually cared to be out there supporting adult runners. The weather is always a factor with an August race, but running on the shaded W & OD Trail seemed to make it much more manageable. Overall, a really great race. Great review & great job !!! What a successful race after a bad day and not even feeling up to it when you got there. I’ve been there on race days like that. On those days I always say that I’m getting my medal just for showing up and not quitting. Congrats on your time despite the circumstances! It was a solid time for your 4 hour marathon goal. Great idea to not look at your watch and be in the zone! I wonder if I would have been strong enough not to look.